Sea, Sand & Sky: Adventure Time! 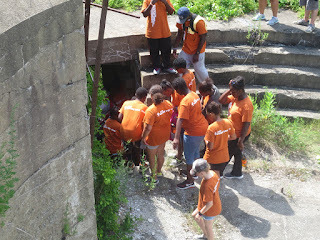 Tuesday, we took the kids at Camp Harbor View on a little adventure! 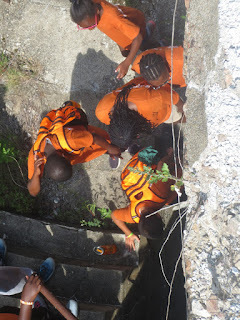 To switch things up a little bit we brought the kids to the old fort at the top of the hill. After a short hike to the top we found the fort; abandoned and begging to be explored! Accompanied by a group of kids I went into the fort, letting them lead the way and figure things out for themselves (as long as it wasn't too dangerous!). While exploring the fort the kids thought they heard a ghost and ran back outside. When I suggested we head back since they were too scared, but they begged to go back in, so in we went. It was exciting for not only them but also for me. Some kids were hiding behind walls and scaring each other (Okay, maybe they scared me once or twice but that was just luck), while others rambled on about who would get taken first if they were in a scary movie. It was really nice to see the kids enjoying themselves during our little exploration and I had a blast doing it with them! Their reactions and made- up stories were priceless and I can't wait until next time!